Professionally Manufacture Wholesale Supply Electrical screen printer, Fully electrical flat cylindrical screen printing machine equipment, Electrical multi-function screen printers. The Electrical screen printer, Fully electrical flat cylindrical screen printing machine equipment, Electrical multi-function screen printers is suitable to print single color on both flat and cylindrical surfaces with various materials such as paper, wood, plastic, metal, glass, or ceramic etc. 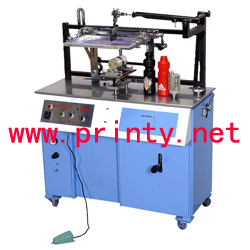 This screen printer printing machine is operated only by electrical power, no need to use the compressed air. Applies the German and Japanese control elements for quiet and accurate printing. Different work sets (See download) are attached with the machine for different printing purposes. Can be operated in manual, auto mode to suit different worker's skill level. Squeegee/flood bar depth, speed and leveling etc. are all adjustable to fit your various printing needs. Work table and screen frame are easy to install and dismount.